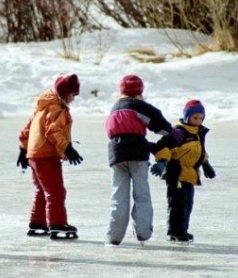 WILTON - The skating rink at Kineowatha Park will open Sunday, Dec. 9 from noon to 6 p.m. Skates are available for use in the warming shack. The warming shack's hours of operation are 3:30 p.m. to 5:30 p.m. on Monday through Thursday; 3:30 p.m. to 6 p.m. on Friday; and noon through 6 p.m. on Saturday and Sunday. The rink lights stay on every night until 8:30 p.m.
Special hours can be arranged for group outings by calling 207-645-4825.